Projects - from fibre to finished article! 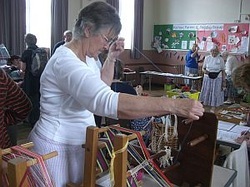 If you know of any other spinning or weaving groups in Devon, please contact us so that we can add to our list. If you would like to learn or practise the crafts of hand-spinning or hand- weaving, there are a number of places to do this. Several groups in the county meet once or twice monthly, or even weekly and, although these smaller groups operate independently, many of their members also belong to the Guild. They are all friendly and welcoming and are glad to meet newcomers of all abilities. Learn or improve your spinning and weaving skills in a Historic building with original Dye House. Spare spinning wheels and free tuition. Venue: Sandford Parish Hall, Sandford, Nr. Crediton. A small, friendly group who are happy to welcome new members and to offer help and advice to beginners. Workshops in related crafts (e.g. dyeing) are occasionally organised. A chance for spinners, weavers and knitters to meet up, swap ideas and inspire each other. Venue: Methodist Church Room, Dalwood, near Axminster. All welcome, spare spinning wheels , free tuition. Craft group meets in the local pub to get creative - informative, supportive and FUN. Venue: The Manor Hall in Berrynarbor (between Combe Martin and Ilfracombe). Manor Hall is well signposted: it is in the centre of the village, behind the Church and has a small car park. Further parking is available in the village car park 200yds away. Tea, coffee and cake are available but please bring your own packed lunch. Meetings: 1.00 - 4.00pm every Wednesday in 'summer time', 1.30-3.30pm in 'winter time'. This well established group shares interests include spinning, weaving, natural and synthetic dyeing and feltmaking. They organise an interesting programme of visiting tutors, share their skills and exhibit and demonstrate locally. The Devon Weavers' Workshop meets at Ashprington, near Totnes and runs regular courses and workshops. Weaving courses for beginners, as well as intermediate & experienced weavers, take place at the historic Coldharbour Mill at Uffculme, near Cullompton on Thursday & Fridays (in term time), with occasional workshops at Easter and in the summer. For more information, email the tutor; loucottey@gmail.com or phone her on 07527 248178. The Devon Adult & Community Learning service sometimes runs hand-weaving courses; for up-to-date information telephone MyDevon on 0845 1551014 or enter 'weaving' in the course finder of the Adult Learning section of the Devon County Council website.